Hello, my name is Ed Adams. I make websites. From complex web applications that help you run every aspect of your business, to straight forward websites to get your business on the web, I can do it all. Here you can see some of the projects I'm proud to have been a part of, then learn about me straight from the people I've had the pleasure of working with. I'd like to work with you next. 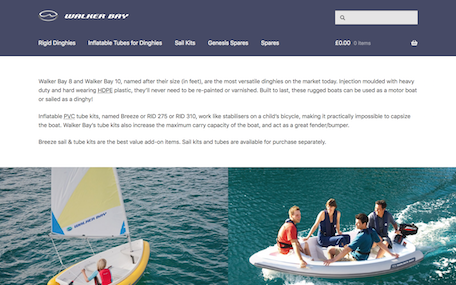 I worked with the Warwick Boats team once again to launch a fully decked out online store for the official UK distributor of Walker Bay boating products. I'm especially proud of the shop's support for paying with credit/debit cards via Stripe integration. 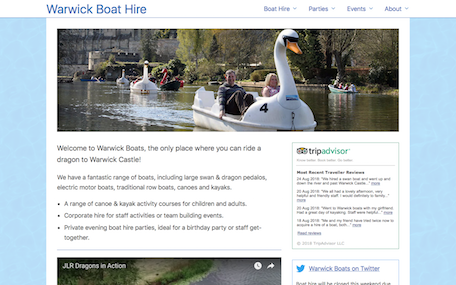 Warwick Boat Hire is a boat hire and leisure centre located in St Nicholas Park, Warwick. I've managed their website for several years and have created custom tools, and helped their staff update conten themselves quickly with WordPress. 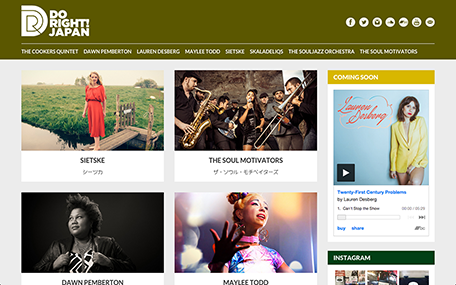 I worked with Do Right Music to design and launch Do Right Japan, which is a sister site to Do Right Canada, which I've also worked on extensively. Having both on Tumblr allows fans to easily share content so musicians enjoy more exposure and it's simple for the company's staff to update. 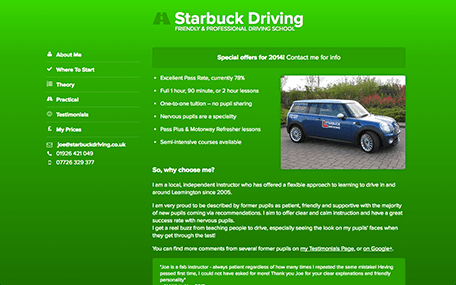 I worked with a local driving instructor on improving his site and creating a bold new design. The rich green colours and clear typography provide visual impact, so the site leaves a lasting impression. 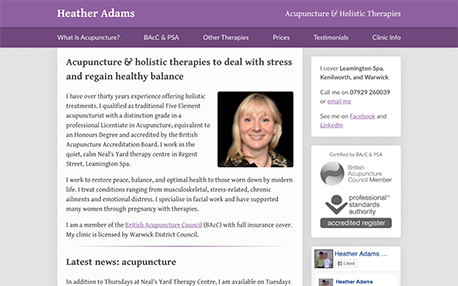 I produced a clean and clear site to help my mum, a qualified acupuncturist, massage therapist & beauty therapist. The site is aimed at helping people to learn more about her, see what she can do to help them and find out her treatment prices quickly. We're always impressed by how quick Ed is to get things done. I can honestly say Ed offers the best website services we've ever used - and we've used a few! I'm very satisfied with the work Ed's done for me. I trust him to know what's best for our site. His ongoing tech support (4 years and counting) has been fantastic. A hardworking developer with the energy and drive to get better with everything he does. I'm very satisfied with the work he's done with us coding designs into HTML. Some work isn't listed, like projects in the midst of development. Check back soon! A website usually costs roughly £500. Prices will vary based on the specifics of what you want, so I encourage you to get in contact with me if you'd like to work with me. This will involve a 30–40 minute chat on the phone as we discuss your requirements and I figure out a custom solution for your specific needs. I do not offer pre-made package pricing as I find every job is different. I won't charge a daily nor hourly rate if I can avoid it, as instead I prefer to quote an exact figure. You approve that before work begins, so you know exactly how much everything costs. You pay nothing until work is completed and you're happy. I will absorb any extras costs (purchasing of your domain name, hosting, email accounts, and so on) and pass that on to you later. I do this as a courtesy so your website operates smoothly without you needing to worry about the impending bills. I built my first website in 2008, it wasn't much but it set me on this path. I enjoyed making it and kept making more. I'd create a fictional business or products and build up a website for it. Each one was a bit better than the last and I eventually decided to go freelance and turn making websites into my careeer. My speciality is front-end development, but I pride myself on offering what I call a "website package", which means you can come to me with just a couple of paragraphs of text and images to start your presence on the web and I can do the rest! Every website you saw above was made by me, either on my own or as a collaboration with a design agency. I've been doing this as my job for eight years and during that time I'm proud of everything I worked on. By far my most popular creation is EA Tumblr Themes, which I made to keep my skills sharp. My themes have been installed on well over 10,000 blogs! Professionally, I've worked on some high profile websites in affiliation with the agency DSC, including work for Mumsnet. Each and every single website I've worked on is one I'm very proud to put my name to.